Presenting The Taking #1 The Taking by Kimberly Derting. Taking alien abduction sequences and turning it into a solid and engaging tale, Kimberly Derting is sure branching out with her literature. 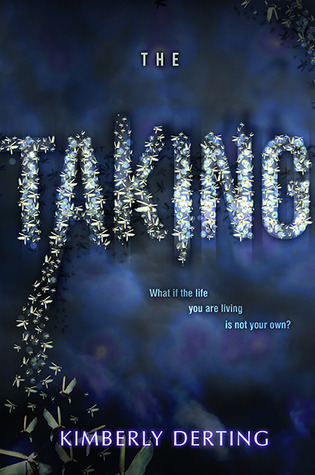 Yes I still need to check out the final books of her 'Body Finder' and 'The Pledge' series but I knew I just had to check out 'The Taking' and color me surprised because I was attracted due to this gorgeous cover and did not check the synopsis before requesting it on edelweiss.... And I loved the experience of it all! This is the story of Kyra Agnew. An ordinary girl, with ordinary parents and ordinary aspirations in life. But a fight with her dad on the topic of college and her boyfriend Austin.... bringing in a chance encounter of the 3rd kind with a bright flash of light and bang! she wakes up 5 years later. With no knowledge of her whereabouts, her life in tatters and her age, seemingly the same as when she had disappeared. Kyra was a beauty to experience. Just like Captain America (don't flame, it is an apt comparison) Kyra is out of her time and the author did a wonderful job of actually illustrating her situation. Everyone has moved on with their lives leaving Kyra behind to reminisce on the past. All she experiences after the mysterious 5 years are shards of a life she should have had..... but it was lost to her. Although she takes everything in her stride and tries with all her might to come out on top. Tyler on the other hand forms the perfect support for Kyra as she searches for a sense of belonging. He is loyal. He is cheesy and he is determined. He is Austin's younger brother and while the elder one chose to move on. Tyler held on to his long term crush..... And his chemistry with Kyra and their gradual romance was a sight for sore eyes and highly appreciated. He proves to be the perfect rock for Kyra as she figures out her circumstances and unearth the mystery of what happened to her in those 5 years..... Coupled with a fast paced and engagingly thrilling plot. You just can't expect not to be hooked. The Taking may start out slow but picks up speed in record time and you are enthralled by this sci-fi, mystery-thriller. Definitely eager to see how the mystery unveils i the next book. "Kimberly Derting serves us an unputdownable sci-fi mystery with fireflies"
So happy you really liked this one as well, I loved it and I can't wait for book two. That ending was killer!! I really liked this book as well, I thought the romance was a little odd initially but they grew on me. I'm super excited for the sequel, that ending was a doozy!